This creative cake was built by Cake Artist Jennifer from flicker (she gave us permission to share her photos with you.) She made it using Food Gel for the Ink Writing and Fondant Decorations. 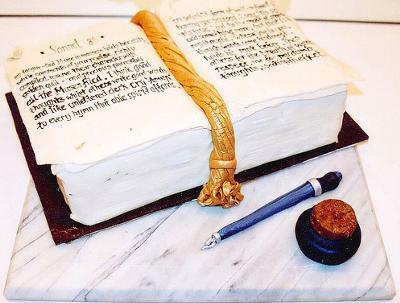 i looked for "sonnet cake" on google and found this... and doing a sonnet on makeing a cake!!! all i gotta say is awessssssssssssome and well done!